The Mezzaluna knife is a handy little tool that is finding its way into more and more home kitchens in recent years. Mezzaluna actually means “half-moon” in Italian. Featuring a curved blade with handles each end it is easy to see why the knife got its name. This curved shape makes the mezzaluna perfect for cutting herbs, spices, vegetables and even pizzas. 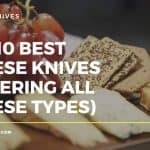 So which is the best mezzaluna knife on the market in 2018? There’s certainly a wide range available. To help you in your search our top 5 table below will give you the details at a glance. For our full Mezzaluna knife reviews, keep on reading. What are Mezzaluna knives used for? 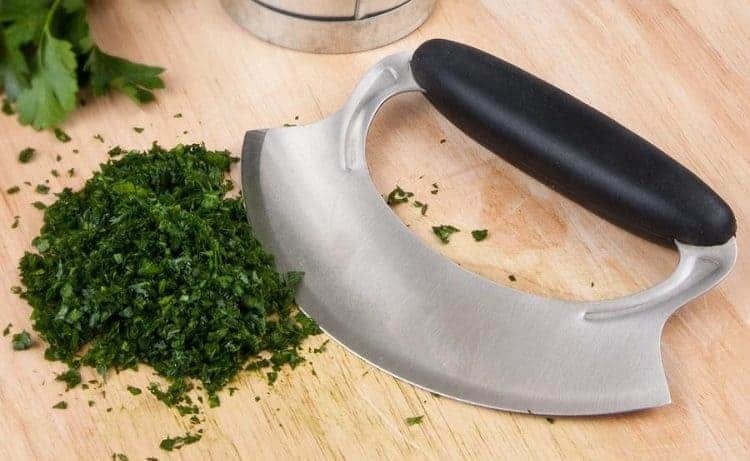 The mezzaluna is most commonly used for chopping herbs. They come in different sizes, with smaller knives being most suitable for herbs and spices, and wider, longer knives that are used for pizzas. The knife originated in Italy because of the many Italian sauces and mixtures that required the fine cutting of ingredients. If you’re a fan of Italian cuisine and often knock up such dishes yourself, you’ll definitely want to have a mezzaluna in your kitchen. One of the most popular sauces it is used for is making pesto. Also, it is used for preparing soups. Whenever you are dealing with a recipe that involves the cutting of lots of vegetables, having a mezzaluna to hand will make the job much easier. What you gain when using a mezzaluna knife is that, for instance, it is a lot safer to use than the regularly shaped knives. It has a handle at each side so no hand is close to the blade while chopping tender food. It is also safe and easy to wash and can be effectively hand washed. It’s best if it’s made out of stainless steel. Besides safety, which comes first, it makes the job easier for beginners. All those lacking knife skills may find the mezzaluna knife relatively easy to use, (when compared to a Japanese Nakiri they are much cheaper too). For those with decent knife skills it makes the job a lot quicker. (Head here for our tips on mastering the 4 major knife strokes). Also, there is a variety of foods that can damage your skin and irritate it, such as chillies. 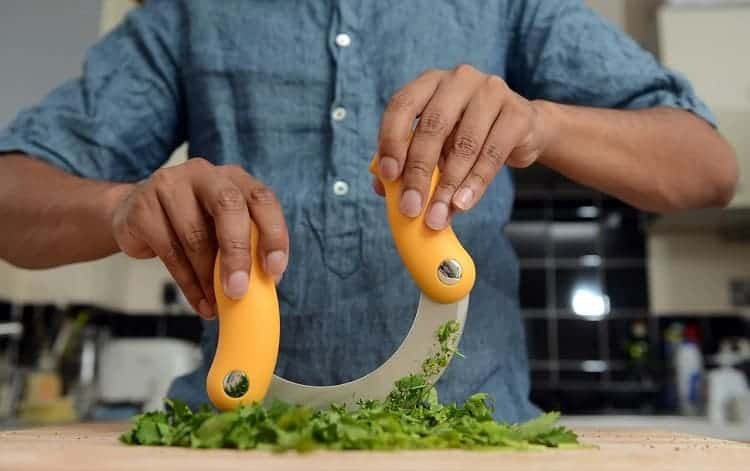 Normally, when cutting these you would require a pair of protection gloves, but since you hold the handles and don’t touch the food directly, there is no need for you to wear them. There are a few issues you should consider when buying a mezzaluna knife. Firstly, make sure it is made of stainless steel. The higher quality steel used the better. This obviously often comes at a price, however paying more in the beginning will save you in the long run. A mezzaluna knife made from superior materials will last you longer and will not need to be sharpened any time soon. It’s best if you choose double handle, single blade mezzaluna knife. It is the easiest to use and it is the original mezzaluna knife. One handle mezzaluna knives are hard to use compared to double handled. 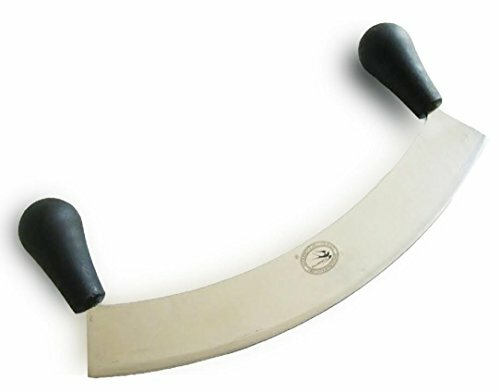 You need to push with only one hand and its curved shape works best with two hands. Consider the materials used for the handles too. Wood is a nice aesthetic, but can sometimes become slippery. Synthetic handles utilising an ergonomic design will often provide better grip. It is recommended to use boards made out of wood as it feels the most natural and you will be using to lay your food on it. Some knives will actually ship with a wooden recessed board to compliment the shape of the mezzaluna. A perfect match makes it much easier to use because it feels like your moves are locked in a loop which you repeat until you have properly chopped your food. 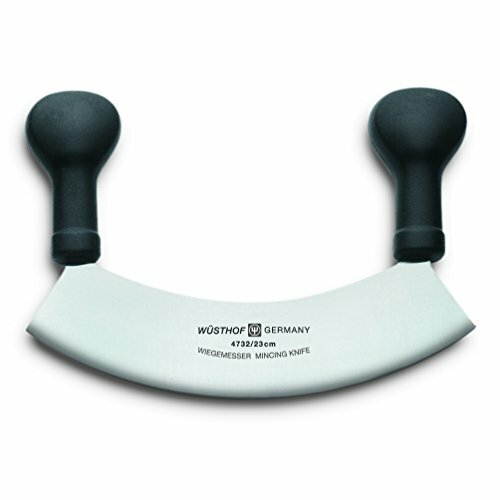 Our top pick Mezzaluna knife is the Wusthof 4372. This beautiful product hits the mark with its superior construction and great performance. 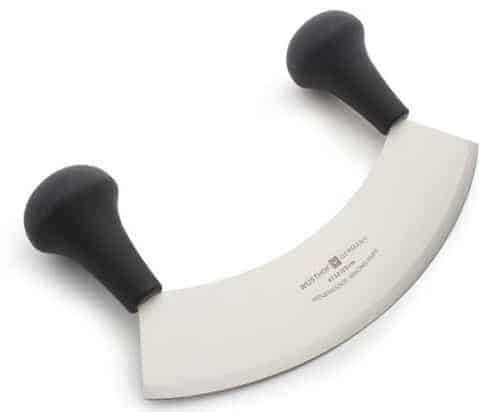 The 9 inch mezzaluna opts for a double handled design providing the balance you need for steady and controlled rocking action while mincing ingredients. The knife is built to last too. The ever reliable Wusthof have not scrimped on materials. The comfortable, yet sturdy synthetic handles are compression riveted to the full tang blade. On the subject of the blade; this is clearly the heart of any knife and you need it to be strong and razor sharp. Here Wusthof do not disappoint. Laser cut from High Carbon German “X50CrMoV15” stainless steel, the whole length of the knife has been specially tempered for increased durability and edge retention. All of this leads to a Mezzaluna knife that stays sharper for longer. One issue to consider with the Wusthof 4732 Mezzaluna is that it does not come with a chopping board. While any regular wooden cutting board will do the job, a bowl shaped board will help keep the ingredients centred as you work. Overall, the Wusthof 4372 9 inch mezzaluna knife ticks all the right boxes. Strong, sharp and well made, the knife has excellent balance and is a real joy to use. Highly recommended. If you’re in the market for spending less on your Mezzaluna (when compared to branded options such as the Wusthof above), this may well be the answer for you. The Mezzaluna knife complete with cutting board, takes care of one of the cons we’ve mentioned elsewhere, (i.e this actually ships with a designated cutting board), while still being of a quality you need for reliable performance. The stainless steel construction goes for a twin blade design, resulting in more efficient cutting. 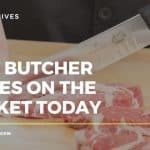 The blades are 11/16″ apart and while this does help prevent food from getting trapped on the inside of the blades, there is no denying the fact the knife is more difficult to clean and maintain in comparison to a single blade mezzaluna; (therefore bare this in mind before you purchase). The cutting board is real treat however, and compliments the package wonderfully. Both the board and handles are made of acacia wood. This raises the bar on the overall aesthetic. The renewable hard wood really looks the part, and is practical too. Rich with natural oils the wooden handles and cutting board have a built in water resistance. The dimensions are good too. The recessed board (designed to prevent ingredients from sliding out of the cutting zone) has a thickness of 1 1/8″ and weighs over 17oz. To top it all off, the package arrives in a boxed set. 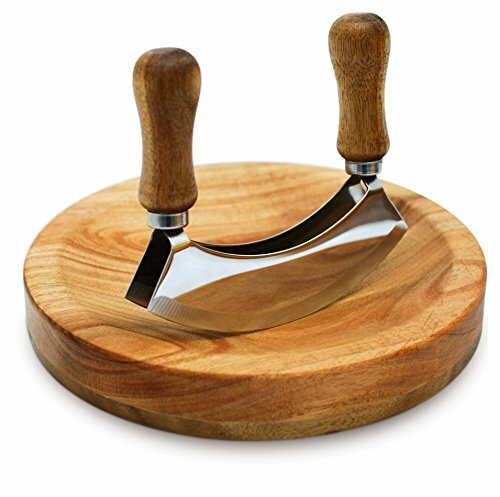 If you are looking for an excellent gift idea for the chef in the family this Christmas, you won’t go wrong with this mezzaluna knife ensemble from White Hat Chef. Overall build quality is not as high as the likes of the Wusthof. An affordable mezzaluna knife solution complete with cutting board and acacia wood finishing. This offering from White Hat Chef very nearly received our mezzaluna knife top rated pick. This is a really good gift option for those with a chef in the family. 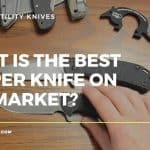 Now we get to the really heavy duty options in our top 5 mezzaluna knife reviews section. This 14 inch commercial grade mezzaluna knife is what you expect to find in a genuine pizza restaurant housed within a medieval Tuscan village. It is big, strong and very, very sharp. 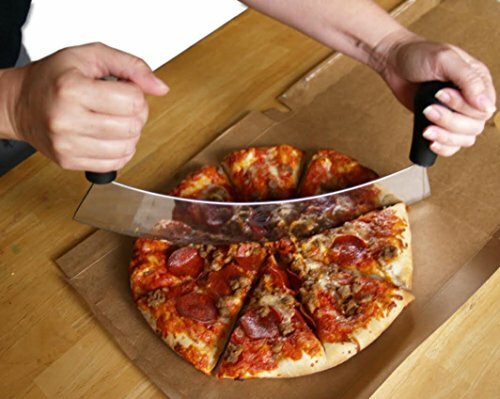 In short, the knife is ideal for cutting pizza and for chopping all those delicious ingredients that make up a quality topping. Manufacturers BruArcher, boast that they only uses the highest quality kitchen grade stainless steel in the construction of their Mezzaluna. The result is a deluxe pizza cutter designed to make your work in the kitchen all the more fun. The aforementioned extremely sharp 14 inch stainless steel rocker blade features 2 durable handles on each end. BruArcher are so confident that you will be happy with their mezzaluna knife offering, they even offer a 100% satisfaction guarantee. If you are after a large sized mezzaluna that means business, than this may well be the option for you. 14 inches of sharp cutting power, make this quite the tool. There are a couple of cons to consider and some really will not require the blade length provided here. The Paderno World Cuisine mezzaluna knife is a great mid-length option. We have covered 14 inch monsters, our top pick goes to a 9 inch model, however here we have a versatile 11 -7/8 inch knife that is able to cover a number of cutting tasks. The manufacturers have opted for a double blade design. 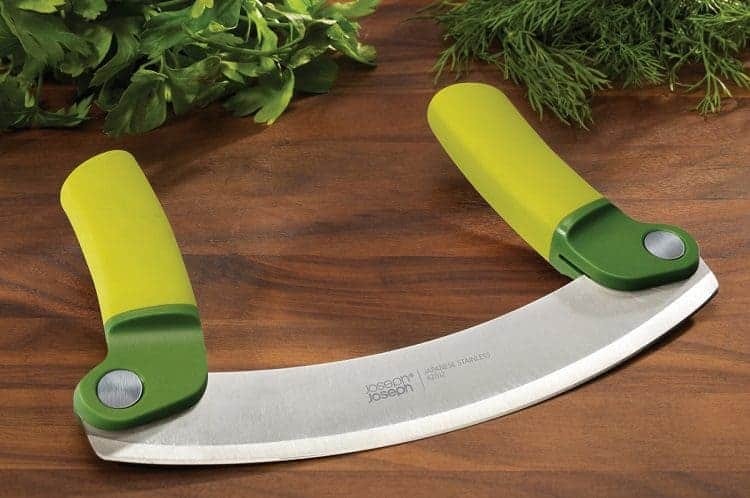 Efficient cutting is the name of the game here; if you work in a busy kitchen and have lots of garlic and herbs to chop (a staple of most Italian dishes) than this knife could be a very wise choice. The blade is stainless steel of course and is shipped nice and sharp. (Should you need to sharpen your blade at a later date, a diamond sharpening stone is a recommended solution; head here for our top 5 picks). The double blade design does require a little more attention to clean, however this is not enough to negate the fact cutting speed is increased. 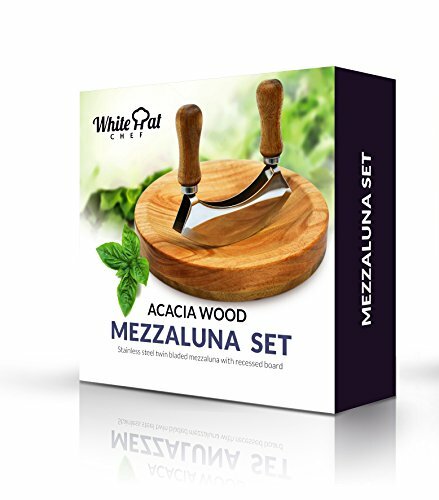 Fast, efficient cutting with a good sized mezzaluna in one handy package. 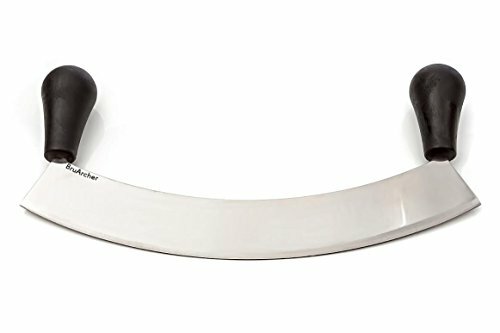 Great for commercial kitchens or the home, this is a highly recommended option for those that need a little more power than an 8 or 9 inch mezzaluna, but would rather not deal with something such as the 14 inch choice above. Another versatile and affordable Mezzaluna here with dimensions measuring in at 10 inches. 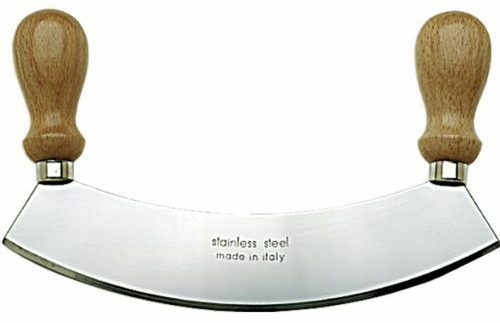 A fabricated stainless steel blade has been incorporated, complete with wooden handles on each end. This both looks good and gets the job done. 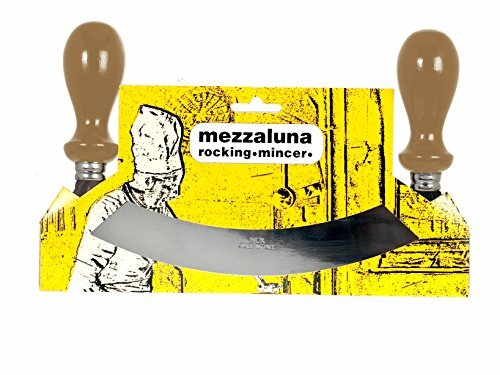 The simple yet effective rocking motion required when using a mezzaluna is easy enough for both beginners and seasoned pros. We will go in to more detail below on exactly how to use a mezzaluna, however one essential element is to understand that the curved shape of the blade allows you to cut without lifting the knife. 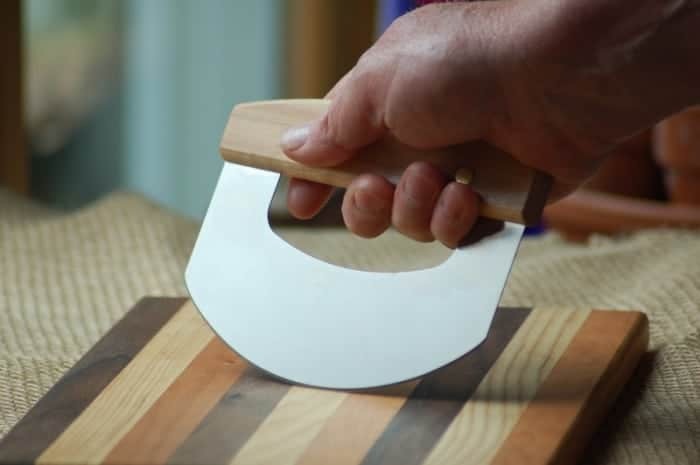 The aim is to rock the mezzaluna back and forth across the length of this curve with the edge remaining true to the cutting board, (that’s why a curved cutting board is all the more useful). Build quality is lower than others in our list; however this is also a lower priced product in comparison. Overall, this is a basic mezzaluna available at an affordable price. It will certainly take care of your cutting needs. However more experienced users may want to opt for a tool with higher quality craftsmanship. In order to properly use it you have to understand and learn the curve of your blade. It should not take much practice. Basically, all you have to do is push down with your hands. 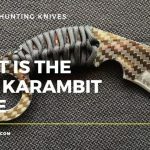 The video both above and below can better explain how to use the knife; a picture is worth a thousand words, (and a video is even better). 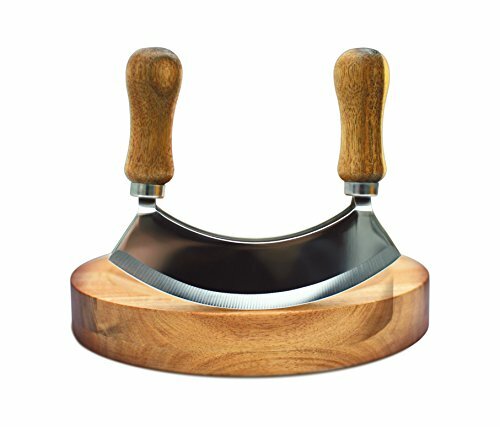 As we have already covered, a mezzaluna most commonly comes with a double handle. For those with any difficulties to grip a regular knife properly, the mezzaluna provides a really helpful alternative. You can achieve getting many different textures when chopping vegetables and herbs when using a mezzaluna knife. You just need to repeat the process, rocking back and forth on the curve of the blade until you get the desired texture. Jamie Oliver eat your heart out!